Photo by Allen Rabinovich, via Berkeleyside. Roger Hanna Morash was an indie game developer who used to work at Harmonix. Among other things, he was code lead on Amplitude and one of the minds behind brain-bending platformer Shard. Yesterday, Morash and his wife, Valerie, unexpectedly passed away. 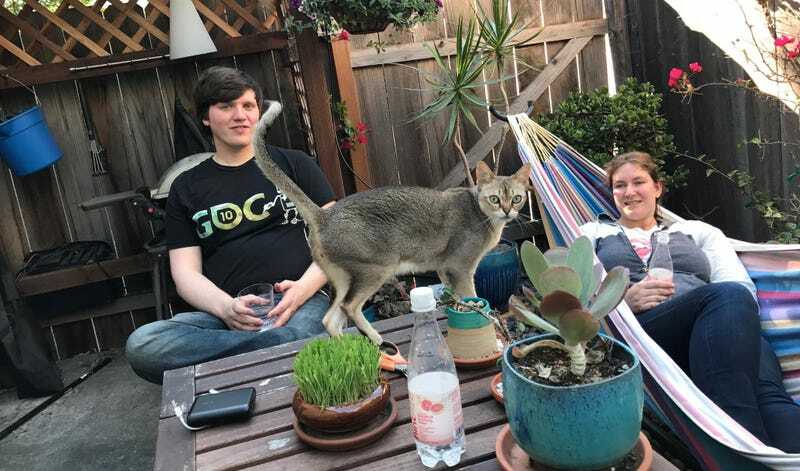 According to local publication SF Gate, the couple’s bodies, along with those of their two cats, were discovered at their Berkeley home yesterday afternoon. Roger was 35, and Valerie was 32. Currently, the cause of death is still unknown. Fire investigators have ruled out all probable hazardous causes, including carbon monoxide poisoning. Homicide detectives are currently involved, but that’s not necessarily an indication of foul play. “We’re still stumped by this one,” police officer Byron White told SF Gate. Morash was well-known and well-liked in the video game development community, especially the Bay Area and Boston scenes. Many were shocked by his passing, and now all they can do is grieve. There’s a GoFundMe to help cover Roger and Valerie’s funeral costs. You can donate to that here, if you’d like. On a personal note, I had the privilege of talking to Roger on a couple occasions when we wound up at the same events in San Francisco. He was a strikingly intelligent person, the sort who could unravel intimidatingly complex concepts like they were rolls of laffy taffy. The first time I ever met him, he showed me a very early demo of Shard. He went on to explain the underpinnings of its beautiful, deceptively intricate engine for more than an hour. He never seemed to tire of talking about his game, though. If anything, he just grew more and more excited, even as my brain transformed into a weary blob from trying to absorb so many new concepts. The next time we saw each other—the only other time I can remember, regrettably—he recognized me instantly. Shamefully, I didn’t recognize him at first. He wasn’t fazed by that at all. He smiled and reminded me about his game, and then proceeded to treat me like an old friend. I didn’t know Roger well, but I do know that you don’t meet many people like that. I’m sad I’ll never get to thank him for being so kind. Best wishes to his family and friends.